Download "4 Testing General and Automated Controls"
1 4 Testing General and Automated Controls Learning Objectives To understand the reasons for testing; To have an idea about Audit Planning and Testing; To discuss testing critical control points; To learn tests of general controls at various levels; To have an idea about Continuous Audit and Embedded Audit Modules, and To discuss hardware testing and review of operating system and network. 4.1 Introduction to Basics of Testing (Reasons for Testing) Testing is a scientific process performed to determine whether the controls ensure the system design effectiveness as well as the implemented system controls operational effectiveness. It involves, understanding a process and the expected results. Testing of large amounts of transactions or data is usually not possible due to time and cost constraints. Hence, sampling is done on the population (system resource) and ensures a sufficient quality and quantity to extrapolate the results of the testing into a reliable conclusion on the entire population (system resource). Testing of Controls involves obtaining the population and conducting the compliance tests either on the entire population and/or on selected samples from the population. It may also be conducted using utilities of audit tools. Testing of the controls design and the reliable results are done by one of the following methods: (i) Substantive Testing: This type of testing is used to substantiate the integrity of the actual processing. It is used to ensure that processes, not controls, are working as per the design of the control and produce the reliable results. (ii) Compliance Testing A compliance test determines if controls are working as designed. As per the policies and procedures, compliance testing results into the adherence to management directives. The Information System (IS) controls audit involves the following three phases: Planning: The auditor determines an effective and efficient way to obtain the evidential matter necessary to achieve the objectives of the IS controls audit and the audit report. For financial audits, the auditor develops an audit strategy and an audit plan. For performance audits, the auditor develops an audit plan. 3 Testing General and Automated Controls 4.3 auditor should look for controls such as input balancing and record or hash totals to ensure that the end user reconciles any differences between input and output. The intensity and extent of the testing should be related to the sensitivity and importance of the application. The auditor should be wary of too much testing and limit his or her tests to controls that cover all the key risk exposures and possible error types. The key audit concern is that the testing should reveal any type of exposure of sensitive data and that the information produced by the application is valid, intact, and correct. One should test the critical controls, processes, and apparent exposures. The auditor performs the necessary testing by using documentary evidence, corroborating interviews, and personal observation. Secondly, we may test the critical controls, processes, and apparent exposures. The auditor performs the necessary testing by using documentary evidence, corroborating interviews, and personal observation. Validation of the information obtained is prescribed by the auditor s work program. Again, this work program is the organized, written, and pre-planned approach to the study of the IT department. It calls for validation in several ways as follows: Asking different personnel the same question and comparing the answers Asking the same question in different ways at different times Comparing checklist answers to work papers, programs, documentation, tests, or other verifiable results Comparing checklist answers to observations and actual system results Conducting mini-studies of critical phases of the operation Such an intensive program allows an auditor to become informed about the operation in a short time. Programs are run on the computer to test and authenticate application programs that are run in normal processing. The audit team selects one of the many Generalized Audit Software (GAS) packages such as Microsoft Access or Excel, IDEA, or ACL and determines what changes are necessary to run the software at the installation. The auditor is to use one of these software s to do sampling, data extraction, exception reporting, summarize and foot totals, and other tasks to perform in-depth analysis and reporting capability IS Controls Audit Process The IS control Audit process involves: Obtaining an understanding of an entity and its operations and key business processes, Obtaining a general understanding of the structure of the entity s networks, Identifying key areas of audit interest (files, applications, systems, locations), Assessing IS risk on a preliminary basis, Identifying critical control points (for example, external access points to networks), Obtaining a preliminary understanding of IS controls, and Performing other audit planning procedures. 4 4.4 Information Systems Control and Audit These tasks are not generally performed as discrete, sequential steps, the IS controls specialist may gather information related to several steps concurrently, such as through interviews with key Information Technology (IT) staff or through data requests, or may perform steps in a different sequence. The auditor performs planning to determine an effective and efficient way to obtain the evidential matter necessary to support the objectives of the IS controls audit and the audit report. The nature and extent of audit planning procedures varies for each audit depending on several factors, including the entity s size and complexity, the auditor s experience with the entity, and the auditor s knowledge of the entity s operations. If the IS controls audit is performed as part of a financial audit, the auditor is to obtain an understanding of internal control over financial reporting sufficient to assess the risk of material misstatement of the financial statements whether due to error or fraud, and to design the nature, timing, and extent of further audit procedures based on that assessment. This includes performing risk assessment procedures to evaluate the design of controls relevant to an audit of financial statements and to determine whether they have been implemented. 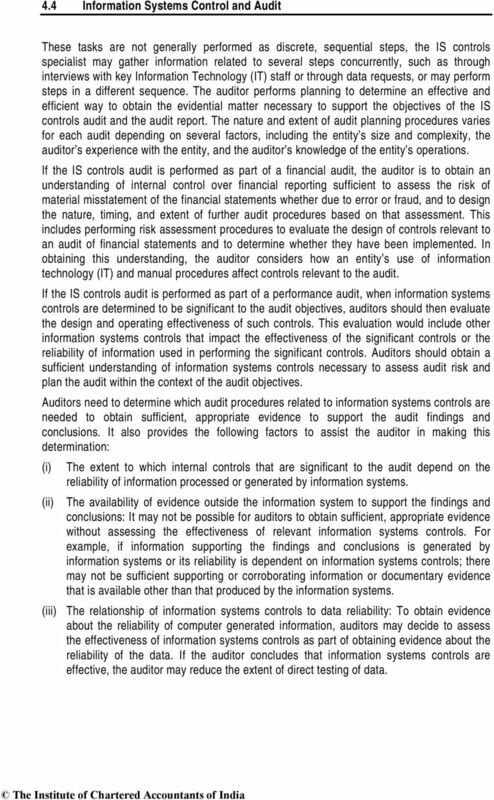 In obtaining this understanding, the auditor considers how an entity s use of information technology (IT) and manual procedures affect controls relevant to the audit. If the IS controls audit is performed as part of a performance audit, when information systems controls are determined to be significant to the audit objectives, auditors should then evaluate the design and operating effectiveness of such controls. This evaluation would include other information systems controls that impact the effectiveness of the significant controls or the reliability of information used in performing the significant controls. Auditors should obtain a sufficient understanding of information systems controls necessary to assess audit risk and plan the audit within the context of the audit objectives. Auditors need to determine which audit procedures related to information systems controls are needed to obtain sufficient, appropriate evidence to support the audit findings and conclusions. It also provides the following factors to assist the auditor in making this determination: (i) The extent to which internal controls that are significant to the audit depend on the reliability of information processed or generated by information systems. (ii) The availability of evidence outside the information system to support the findings and conclusions: It may not be possible for auditors to obtain sufficient, appropriate evidence without assessing the effectiveness of relevant information systems controls. For example, if information supporting the findings and conclusions is generated by information systems or its reliability is dependent on information systems controls; there may not be sufficient supporting or corroborating information or documentary evidence that is available other than that produced by the information systems. (iii) The relationship of information systems controls to data reliability: To obtain evidence about the reliability of computer generated information, auditors may decide to assess the effectiveness of information systems controls as part of obtaining evidence about the reliability of the data. If the auditor concludes that information systems controls are effective, the auditor may reduce the extent of direct testing of data. 6 4.6 Information Systems Control and Audit identified design weaknesses on the completeness, accuracy, validity, and confidentiality of application data; Any internal or third-party information systems reviews, audits, or specialized systems testing (e.g., penetration tests, disaster recovery tests, and application-specific tests) performed during the last year; Management s plans of action and milestones, or their equivalent, that identify corrective actions planned to address known IS weaknesses and IS control weaknesses; Status of the prior years audit findings; Documentation for any significant computer security related incidents identified and reported for the last year; Documented security plans; Documented risk assessments for relevant systems (e.g., general support systems and major applications); System certification and accreditation documentation or equivalent for relevant systems; Documented business continuity of operations plans and disaster recovery plans; A description of the entity s use of third-party IT services; Relevant laws and regulations and their relation to the audit objectives; Description of the auditor s procedures to consider the risk of fraud, any fraud risk factors that the auditor believes could affect the audit objectives, and planned audit procedures to detect any fraud significant to the audit objectives. Audit resources planned. Current multiyear testing plans. Documentation of communications with entity management. If IS controls are performed by service organizations, conclusions whether such controls are significant to the audit objectives and any audit procedures performed with respect to such controls (e.g., review of service auditor reports) If the auditor plans to use the work of others, conclusions concerning the planned use of the work of others and any audit procedures performed with respect to using the work of others. 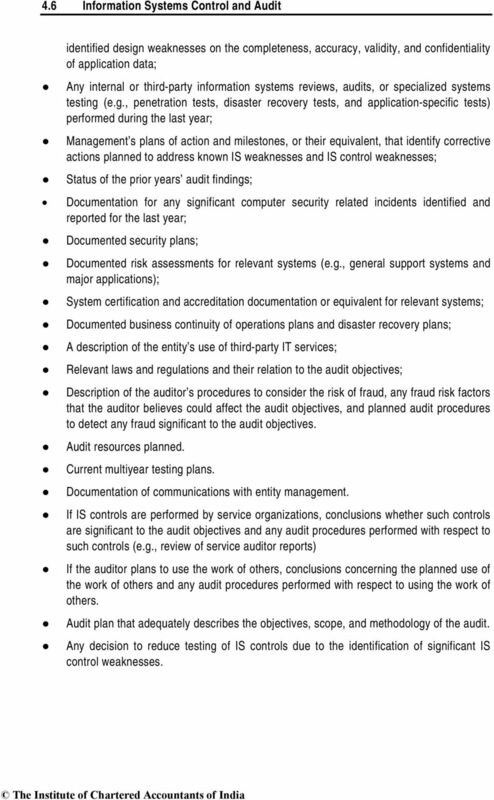 Audit plan that adequately describes the objectives, scope, and methodology of the audit. Any decision to reduce testing of IS controls due to the identification of significant IS control weaknesses. 10 4.10 Information Systems Control and Audit tested namely general and/or business process application level controls to be tested, or selected components; or all levels of the entity s information systems, or selected levels (e.g., entitywide, system level, or business process application level, or selected components of them. 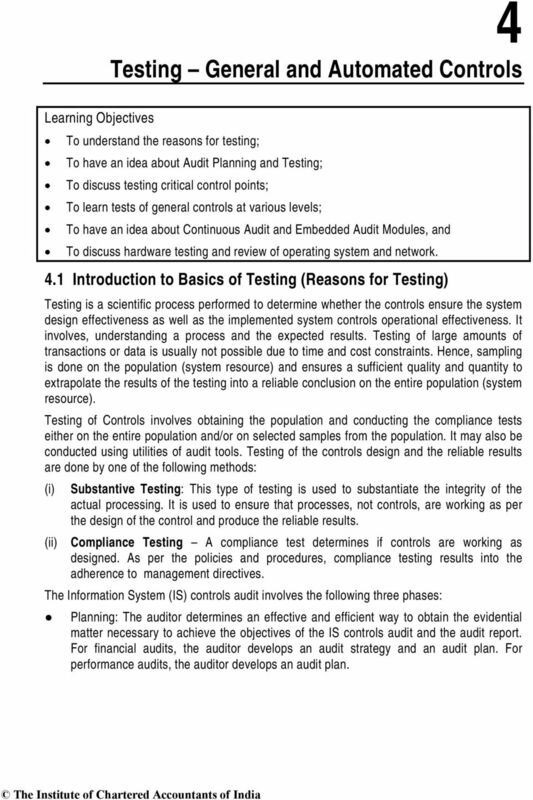 4.5 Test Effectiveness of Information System Controls The auditor should design and conduct tests of relevant control techniques that are effective in design to determine their effectiveness in operation. 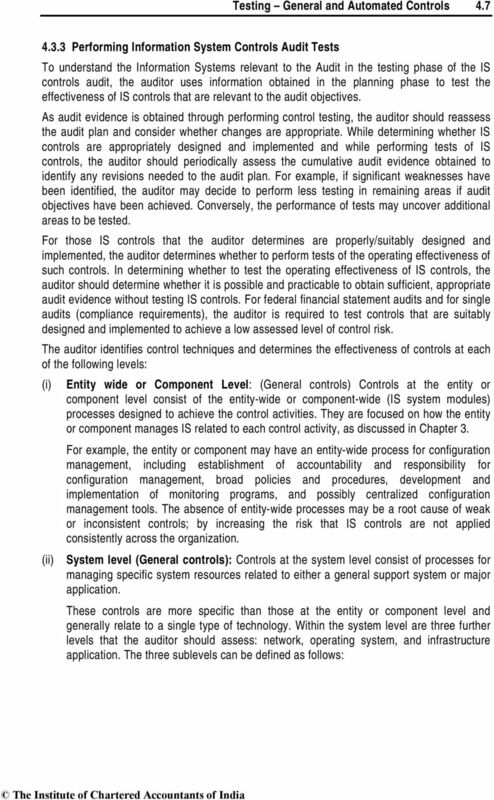 It is generally more efficient for the auditor to test IS controls on a tiered basis, starting with the general controls at the entitywide and system levels, followed by the general controls at the business process application level, and concluding with tests of business process application, interface, and data management system controls at the business process application level. Such a testing strategy may be used because ineffective IS controls at each tier generally preclude effective controls at the subsequent tier. 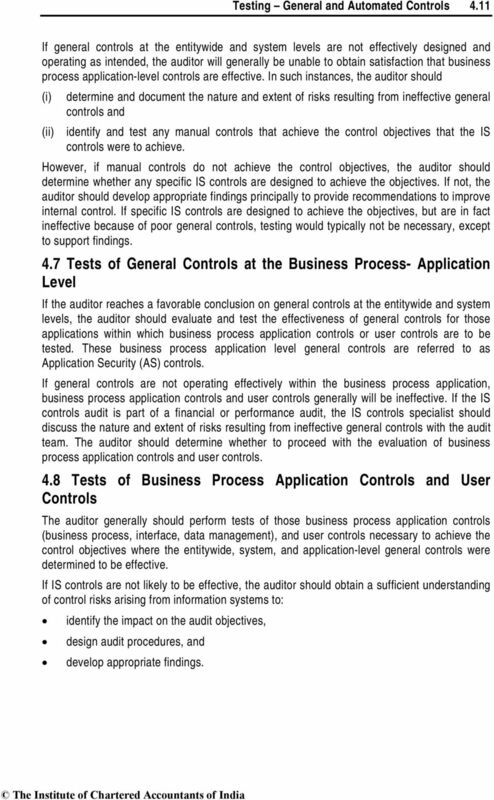 If the auditor identifies IS controls for testing, the auditor should evaluate the effectiveness of general controls at the entitywide and system level; general controls at the business process application level; and specific business process application controls (business process controls, interface controls, data management system controls), and/or user controls, unless the IS controls that achieve the control objectives are general controls. 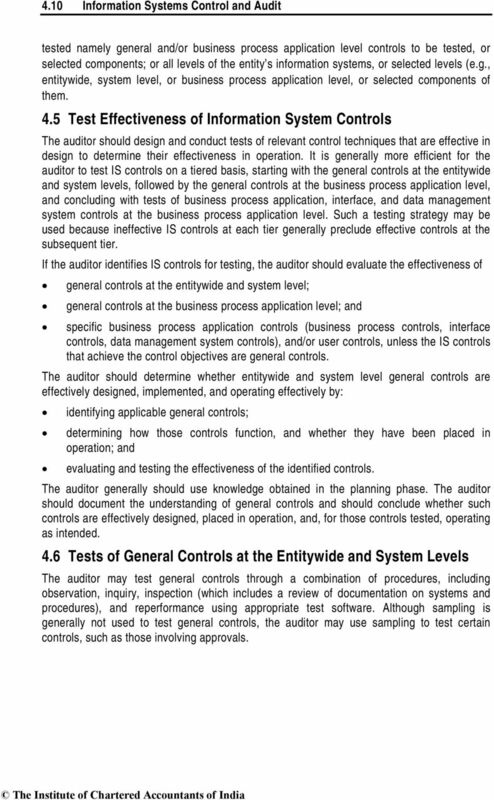 The auditor should determine whether entitywide and system level general controls are effectively designed, implemented, and operating effectively by: identifying applicable general controls; determining how those controls function, and whether they have been placed in operation; and evaluating and testing the effectiveness of the identified controls. The auditor generally should use knowledge obtained in the planning phase. The auditor should document the understanding of general controls and should conclude whether such controls are effectively designed, placed in operation, and, for those controls tested, operating as intended. 4.6 Tests of General Controls at the Entitywide and System Levels The auditor may test general controls through a combination of procedures, including observation, inquiry, inspection (which includes a review of documentation on systems and procedures), and reperformance using appropriate test software. Although sampling is generally not used to test general controls, the auditor may use sampling to test certain controls, such as those involving approvals. 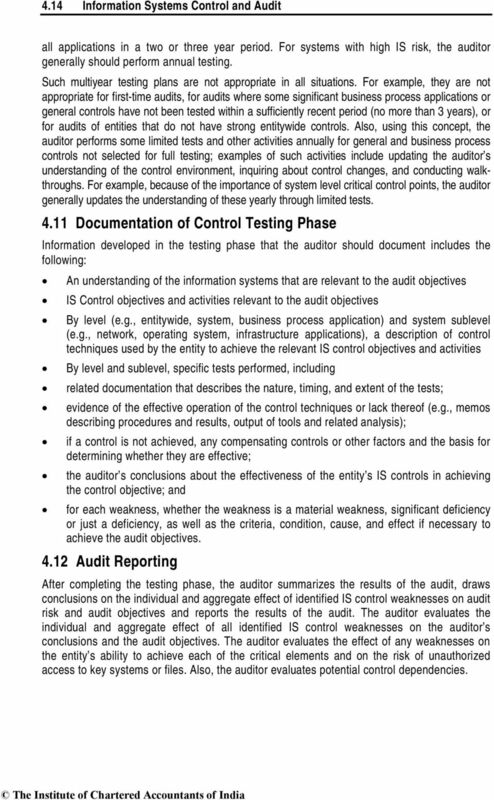 11 Testing General and Automated Controls 4.11 If general controls at the entitywide and system levels are not effectively designed and operating as intended, the auditor will generally be unable to obtain satisfaction that business process application-level controls are effective. In such instances, the auditor should (i) determine and document the nature and extent of risks resulting from ineffective general controls and (ii) identify and test any manual controls that achieve the control objectives that the IS controls were to achieve. However, if manual controls do not achieve the control objectives, the auditor should determine whether any specific IS controls are designed to achieve the objectives. If not, the auditor should develop appropriate findings principally to provide recommendations to improve internal control. If specific IS controls are designed to achieve the objectives, but are in fact ineffective because of poor general controls, testing would typically not be necessary, except to support findings. 4.7 Tests of General Controls at the Business Process- Application Level If the auditor reaches a favorable conclusion on general controls at the entitywide and system levels, the auditor should evaluate and test the effectiveness of general controls for those applications within which business process application controls or user controls are to be tested. 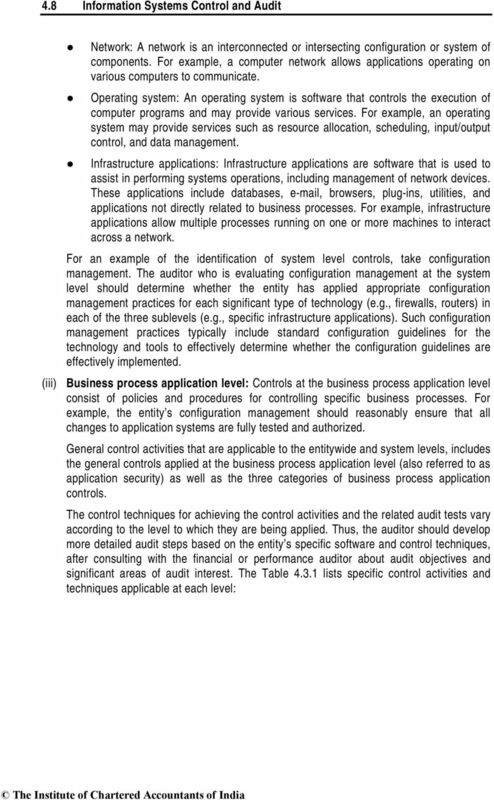 These business process application level general controls are referred to as Application Security (AS) controls. If general controls are not operating effectively within the business process application, business process application controls and user controls generally will be ineffective. If the IS controls audit is part of a financial or performance audit, the IS controls specialist should discuss the nature and extent of risks resulting from ineffective general controls with the audit team. The auditor should determine whether to proceed with the evaluation of business process application controls and user controls. 4.8 Tests of Business Process Application Controls and User Controls The auditor generally should perform tests of those business process application controls (business process, interface, data management), and user controls necessary to achieve the control objectives where the entitywide, system, and application-level general controls were determined to be effective. If IS controls are not likely to be effective, the auditor should obtain a sufficient understanding of control risks arising from information systems to: identify the impact on the audit objectives, design audit procedures, and develop appropriate findings. 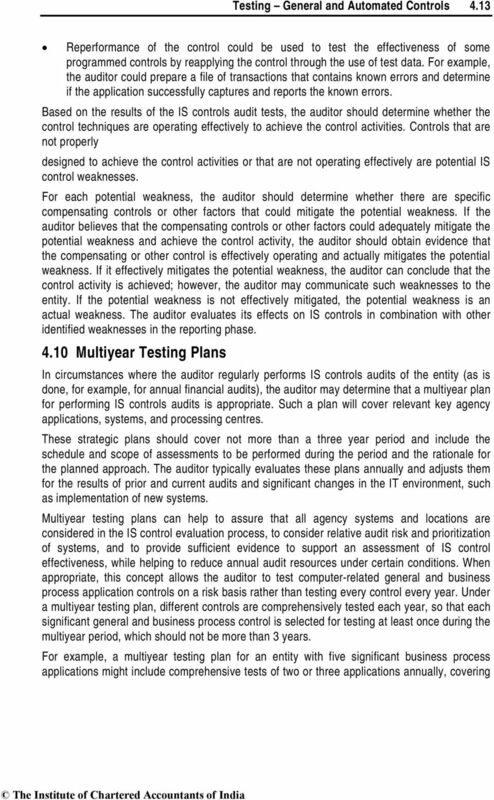 12 4.12 Information Systems Control and Audit Also, in such circumstances, the auditor considers whether manual controls achieve the control objectives, including manual controls that may mitigate weaknesses in IS controls. If IS controls are not likely to be effective and if manual controls do not achieve the control objectives, the auditor should identify and evaluate any specific IS controls that are designed to achieve the control objectives to develop recommendations for improving internal controls. IS controls that are not effective in design do not need to be tested. If the auditor determined in a prior year that controls in a particular accounting application were ineffective and if management indicates that controls have not significantly improved, the auditor need not test them. 4.9 Appropriateness of Control Tests To assess the operating effectiveness of IS controls, auditors should perform an appropriate mix of audit procedures to obtain sufficient, appropriate evidence to support their conclusions. 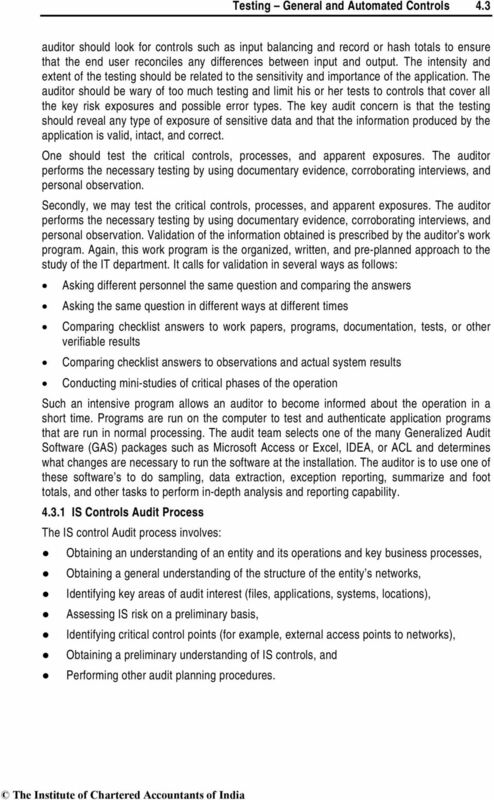 Such procedures could include the following: Inquiries of IT and management personnel can enable the auditor to gather a wide variety of information about the operating effectiveness of control techniques. The auditor should corroborate responses to inquiries with other techniques. Questionnaires can be used to obtain information on controls and how they are designed. Observation of the operation of controls can be a reliable source of evidence. For example, the auditor may observe the verification of edit checks and password controls. However, observation provides evidence about controls only when the auditor was present. The auditor needs other evidence to be satisfied controls functioned the same way throughout the period. The auditor may review documentation of control polices and procedures. For example, the entity may have written policies regarding confidentiality or logical access. 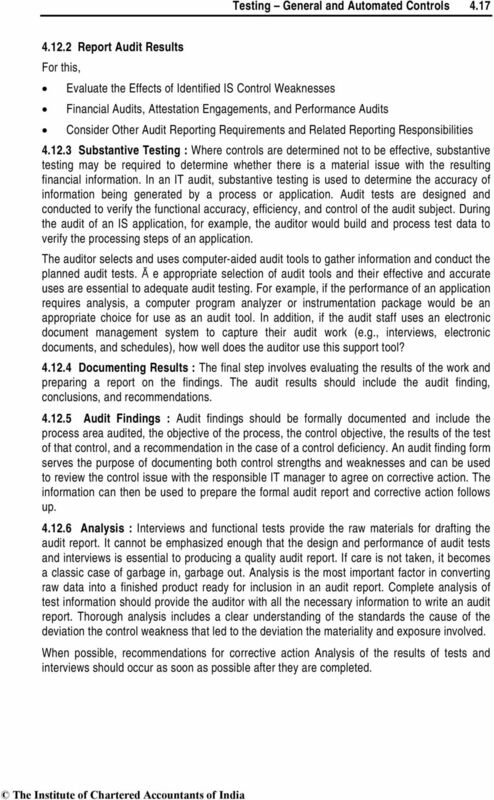 Review of documents will allow the auditors to understand and assess the design of controls. Inspection of approvals/reviews provides the auditor with evidence that management is performing appropriate control checks. The auditor may combine these tests with discussions and observations. Analysis of system information (e.g., configuration settings, access control lists, etc.) obtained through system or specialized software provides the auditor with evidence about actual system configuration. Data review and analysis of the output of the application processing may provide evidence about the accuracy of processing. For example, a detailed review of the data elements or analytical procedures of the data as a whole may reveal the existence of errors. Computer-assisted audit techniques (CAAT) may be used to test data files to determine whether invalid transactions were identified and corrected by programmed controls. However, the absence of invalid transactions alone is insufficient evidence that the controls effectively operated. 14 4.14 Information Systems Control and Audit all applications in a two or three year period. For systems with high IS risk, the auditor generally should perform annual testing. Such multiyear testing plans are not appropriate in all situations. For example, they are not appropriate for first-time audits, for audits where some significant business process applications or general controls have not been tested within a sufficiently recent period (no more than 3 years), or for audits of entities that do not have strong entitywide controls. 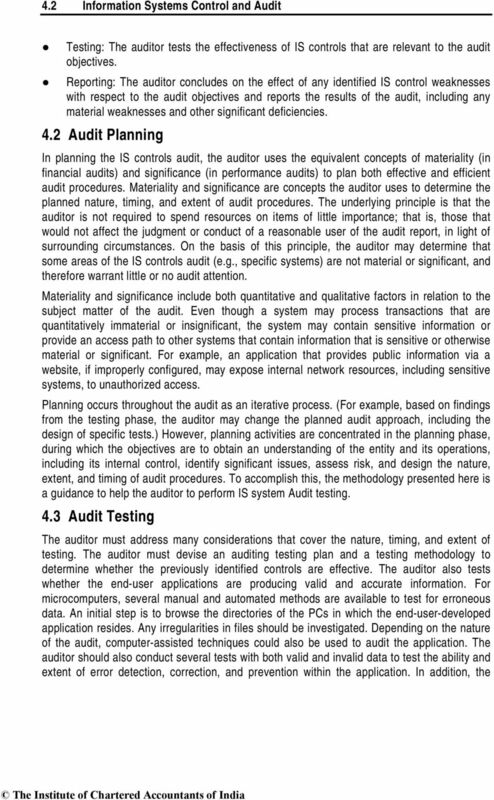 Also, using this concept, the auditor performs some limited tests and other activities annually for general and business process controls not selected for full testing; examples of such activities include updating the auditor s understanding of the control environment, inquiring about control changes, and conducting walkthroughs. 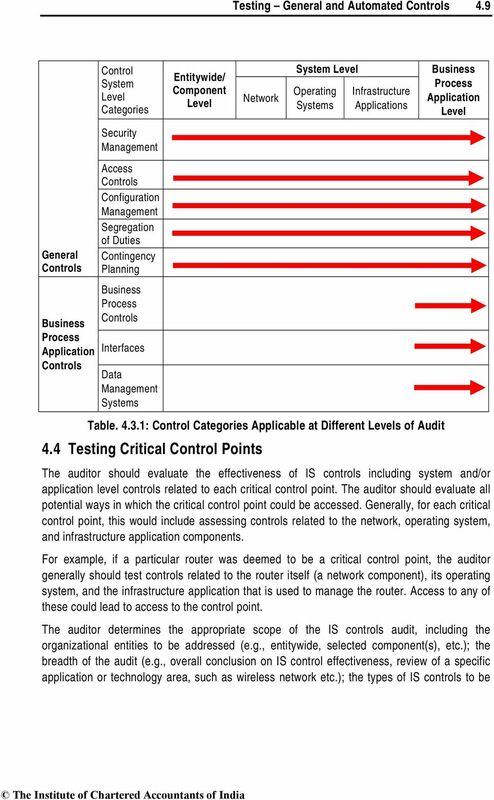 For example, because of the importance of system level critical control points, the auditor generally updates the understanding of these yearly through limited tests Documentation of Control Testing Phase Information developed in the testing phase that the auditor should document includes the following: An understanding of the information systems that are relevant to the audit objectives IS Control objectives and activities relevant to the audit objectives By level (e.g., entitywide, system, business process application) and system sublevel (e.g., network, operating system, infrastructure applications), a description of control techniques used by the entity to achieve the relevant IS control objectives and activities By level and sublevel, specific tests performed, including related documentation that describes the nature, timing, and extent of the tests; evidence of the effective operation of the control techniques or lack thereof (e.g., memos describing procedures and results, output of tools and related analysis); if a control is not achieved, any compensating controls or other factors and the basis for determining whether they are effective; the auditor s conclusions about the effectiveness of the entity s IS controls in achieving the control objective; and for each weakness, whether the weakness is a material weakness, significant deficiency or just a deficiency, as well as the criteria, condition, cause, and effect if necessary to achieve the audit objectives Audit Reporting After completing the testing phase, the auditor summarizes the results of the audit, draws conclusions on the individual and aggregate effect of identified IS control weaknesses on audit risk and audit objectives and reports the results of the audit. The auditor evaluates the individual and aggregate effect of all identified IS control weaknesses on the auditor s conclusions and the audit objectives. The auditor evaluates the effect of any weaknesses on the entity s ability to achieve each of the critical elements and on the risk of unauthorized access to key systems or files. Also, the auditor evaluates potential control dependencies. 15 Testing General and Automated Controls 4.15 For each critical element, the auditor should make a summary determination as to the effectiveness of the entity s related controls, considering entitywide, system, and business process application levels collectively. The auditor should evaluate the effect of related underlying control activities that are not achieved. In addition, the auditor should determine whether the weaknesses preclude the effectiveness of each of the five categories of general controls or the four categories of application-level controls. If the controls for one or more of each category s critical elements are ineffective, then the controls for the entire category are not likely to be effective. The auditor uses professional judgment in making such determinations. For federal entities, if identified weaknesses relate to IS measures reported in FISMA reporting, the auditor should determine whether they were properly reported. Also, the auditor should determine whether IS control weaknesses identified by the audit were identified in the entity s Plans of Action and Milestones (POA&M s) or equivalent document. If not, the auditor generally should attempt to determine why they were not identified by the entity as appropriate and report weaknesses in the reporting process. 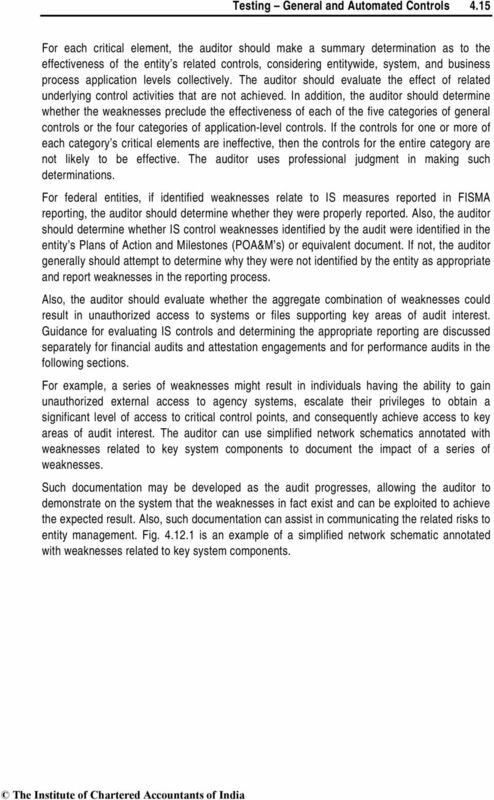 Also, the auditor should evaluate whether the aggregate combination of weaknesses could result in unauthorized access to systems or files supporting key areas of audit interest. Guidance for evaluating IS controls and determining the appropriate reporting are discussed separately for financial audits and attestation engagements and for performance audits in the following sections. For example, a series of weaknesses might result in individuals having the ability to gain unauthorized external access to agency systems, escalate their privileges to obtain a significant level of access to critical control points, and consequently achieve access to key areas of audit interest. 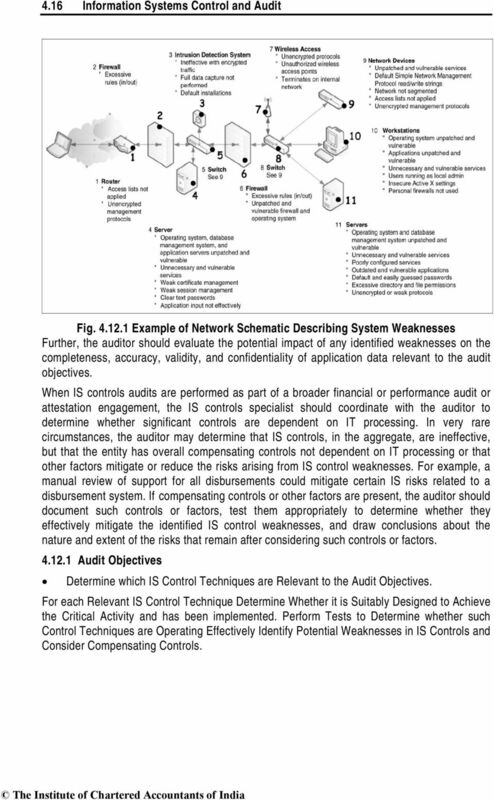 The auditor can use simplified network schematics annotated with weaknesses related to key system components to document the impact of a series of weaknesses. Such documentation may be developed as the audit progresses, allowing the auditor to demonstrate on the system that the weaknesses in fact exist and can be exploited to achieve the expected result. Also, such documentation can assist in communicating the related risks to entity management. Fig is an example of a simplified network schematic annotated with weaknesses related to key system components. 16 4.16 Information Systems Control and Audit Fig Example of Network Schematic Describing System Weaknesses Further, the auditor should evaluate the potential impact of any identified weaknesses on the completeness, accuracy, validity, and confidentiality of application data relevant to the audit objectives. When IS controls audits are performed as part of a broader financial or performance audit or attestation engagement, the IS controls specialist should coordinate with the auditor to determine whether significant controls are dependent on IT processing. In very rare circumstances, the auditor may determine that IS controls, in the aggregate, are ineffective, but that the entity has overall compensating controls not dependent on IT processing or that other factors mitigate or reduce the risks arising from IS control weaknesses. For example, a manual review of support for all disbursements could mitigate certain IS risks related to a disbursement system. 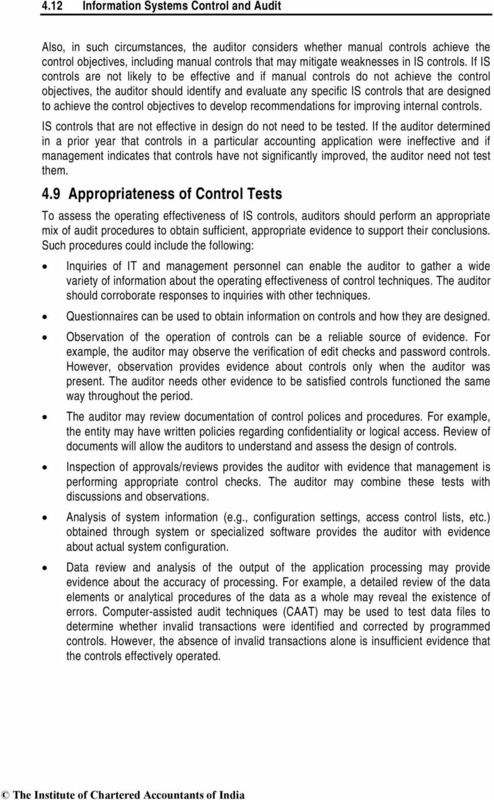 If compensating controls or other factors are present, the auditor should document such controls or factors, test them appropriately to determine whether they effectively mitigate the identified IS control weaknesses, and draw conclusions about the nature and extent of the risks that remain after considering such controls or factors Audit Objectives Determine which IS Control Techniques are Relevant to the Audit Objectives. For each Relevant IS Control Technique Determine Whether it is Suitably Designed to Achieve the Critical Activity and has been implemented. Perform Tests to Determine whether such Control Techniques are Operating Effectively Identify Potential Weaknesses in IS Controls and Consider Compensating Controls. 17 Testing General and Automated Controls Report Audit Results For this, Evaluate the Effects of Identified IS Control Weaknesses Financial Audits, Attestation Engagements, and Performance Audits Consider Other Audit Reporting Requirements and Related Reporting Responsibilities Substantive Testing : Where controls are determined not to be effective, substantive testing may be required to determine whether there is a material issue with the resulting financial information. In an IT audit, substantive testing is used to determine the accuracy of information being generated by a process or application. Audit tests are designed and conducted to verify the functional accuracy, efficiency, and control of the audit subject. During the audit of an IS application, for example, the auditor would build and process test data to verify the processing steps of an application. The auditor selects and uses computer-aided audit tools to gather information and conduct the planned audit tests. Ā e appropriate selection of audit tools and their effective and accurate uses are essential to adequate audit testing. For example, if the performance of an application requires analysis, a computer program analyzer or instrumentation package would be an appropriate choice for use as an audit tool. In addition, if the audit staff uses an electronic document management system to capture their audit work (e.g., interviews, electronic documents, and schedules), how well does the auditor use this support tool? Documenting Results : The final step involves evaluating the results of the work and preparing a report on the findings. The audit results should include the audit finding, conclusions, and recommendations Audit Findings : Audit findings should be formally documented and include the process area audited, the objective of the process, the control objective, the results of the test of that control, and a recommendation in the case of a control deficiency. An audit finding form serves the purpose of documenting both control strengths and weaknesses and can be used to review the control issue with the responsible IT manager to agree on corrective action. The information can then be used to prepare the formal audit report and corrective action follows up Analysis : Interviews and functional tests provide the raw materials for drafting the audit report. It cannot be emphasized enough that the design and performance of audit tests and interviews is essential to producing a quality audit report. If care is not taken, it becomes a classic case of garbage in, garbage out. Analysis is the most important factor in converting raw data into a finished product ready for inclusion in an audit report. Complete analysis of test information should provide the auditor with all the necessary information to write an audit report. Thorough analysis includes a clear understanding of the standards the cause of the deviation the control weakness that led to the deviation the materiality and exposure involved. When possible, recommendations for corrective action Analysis of the results of tests and interviews should occur as soon as possible after they are completed. 18 4.18 Information Systems Control and Audit Too often, the bulk of audit analysis occurs when the auditor sits down and writes the audit report. Timely analysis enables the auditor to determine the causes and exposures of findings early in the audit. This gives the auditor time to conduct further testing when necessary and allows everyone more time to create corrective actions. It also promotes the better use of audit time by determining findings and exposures with a minimum of testing. One of the purposes of the current work paper guidelines is to provide documentation of this analysis process. Four analysis steps may be needed: Reexamine the standards and the facts Determine the cause of the deviation Determine the materiality and exposure of the deviation Determine possible recommendations for corrective action Although these are referred to as steps, they are not necessarily performed in chronological order. Likewise, completion of one step is not always necessary to complete later steps. As in all other areas of auditing, analysis requires judgment. Following is a discussion of each of the four steps in more detail. The terms finding, deficiency, problem, and issues are basically synonymous and mean the auditor identified a situation where controls or efficiencies can be improved. The situation, if acted upon, could result in enhanced productivity; the deterrence of fraud; or the prevention of monetary loss, personal injury, or environmental damage Reexamination : This is the most essential step in performing analysis. From this step, the auditor has the requisite data to make a judgment and formulate an opinion. The two factors under consideration are a standard (for comparison to the facts) and the facts (to compare to the standard). Step one reviews the standard, the facts, and whether a discrepancy actually exists between the two Standards Compliance : Standards are the procedures, operating guidelines, regulations, good business practices, or other predefined methodologies that define how an operation under audit should function. 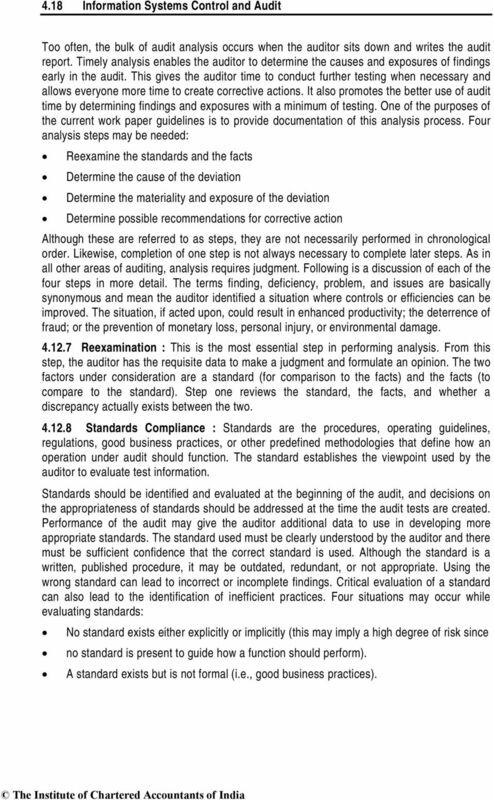 The standard establishes the viewpoint used by the auditor to evaluate test information. Standards should be identified and evaluated at the beginning of the audit, and decisions on the appropriateness of standards should be addressed at the time the audit tests are created. Performance of the audit may give the auditor additional data to use in developing more appropriate standards. The standard used must be clearly understood by the auditor and there must be sufficient confidence that the correct standard is used. Although the standard is a written, published procedure, it may be outdated, redundant, or not appropriate. Using the wrong standard can lead to incorrect or incomplete findings. Critical evaluation of a standard can also lead to the identification of inefficient practices. Four situations may occur while evaluating standards: No standard exists either explicitly or implicitly (this may imply a high degree of risk since no standard is present to guide how a function should perform). A standard exists but is not formal (i.e., good business practices). 19 Testing General and Automated Controls 4.19 The standard is formal and published but is redundant, not cost effective, no longer necessary, or no longer appropriate in some other manner. The standard is formal and is appropriate for evaluating the work performed Facts : After reviewing the standard, the auditor must evaluate the gathered facts. The auditor should re-verify that deviations found are representative of the current control environment, have adequate support (photocopies or other hard evidence if possible), and, whenever possible, have an agreement with the audit client that deviations exist. 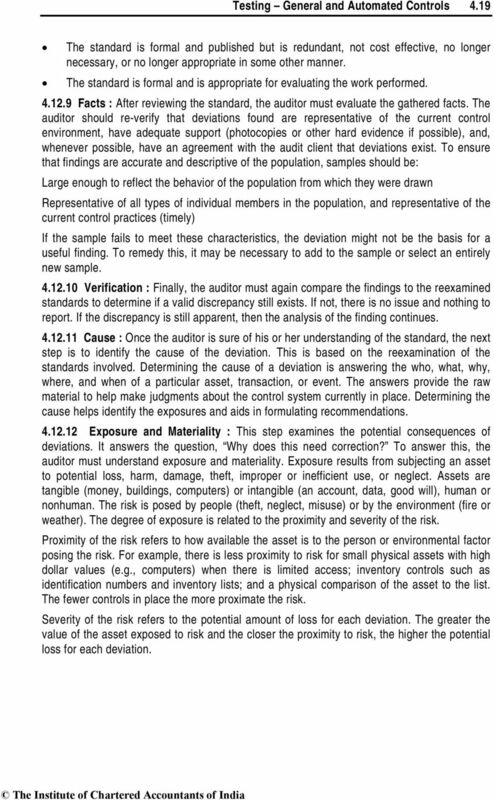 To ensure that findings are accurate and descriptive of the population, samples should be: Large enough to reflect the behavior of the population from which they were drawn Representative of all types of individual members in the population, and representative of the current control practices (timely) If the sample fails to meet these characteristics, the deviation might not be the basis for a useful finding. To remedy this, it may be necessary to add to the sample or select an entirely new sample Verification : Finally, the auditor must again compare the findings to the reexamined standards to determine if a valid discrepancy still exists. If not, there is no issue and nothing to report. If the discrepancy is still apparent, then the analysis of the finding continues Cause : Once the auditor is sure of his or her understanding of the standard, the next step is to identify the cause of the deviation. This is based on the reexamination of the standards involved. Determining the cause of a deviation is answering the who, what, why, where, and when of a particular asset, transaction, or event. The answers provide the raw material to help make judgments about the control system currently in place. Determining the cause helps identify the exposures and aids in formulating recommendations Exposure and Materiality : This step examines the potential consequences of deviations. It answers the question, Why does this need correction? 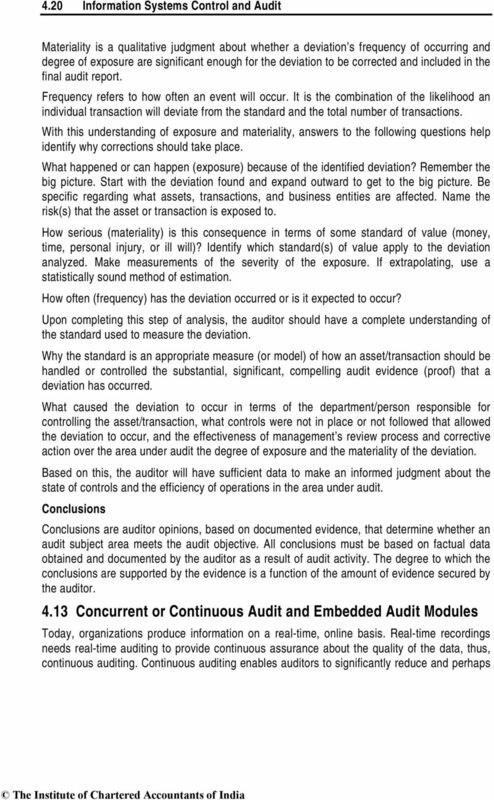 To answer this, the auditor must understand exposure and materiality. Exposure results from subjecting an asset to potential loss, harm, damage, theft, improper or inefficient use, or neglect. Assets are tangible (money, buildings, computers) or intangible (an account, data, good will), human or nonhuman. The risk is posed by people (theft, neglect, misuse) or by the environment (fire or weather). The degree of exposure is related to the proximity and severity of the risk. Proximity of the risk refers to how available the asset is to the person or environmental factor posing the risk. For example, there is less proximity to risk for small physical assets with high dollar values (e.g., computers) when there is limited access; inventory controls such as identification numbers and inventory lists; and a physical comparison of the asset to the list. The fewer controls in place the more proximate the risk. Severity of the risk refers to the potential amount of loss for each deviation. The greater the value of the asset exposed to risk and the closer the proximity to risk, the higher the potential loss for each deviation. This release of the FISCAM document has been reformatted from the January 1999 version. Performing Audit Procedures in Response to Assessed Risks 327 AU-C Section 330 Performing Audit Procedures in Response to Assessed Risks and Evaluating the Audit Evidence Obtained Source: SAS No. 122. Overall Audit Plan and Audit Program. I. 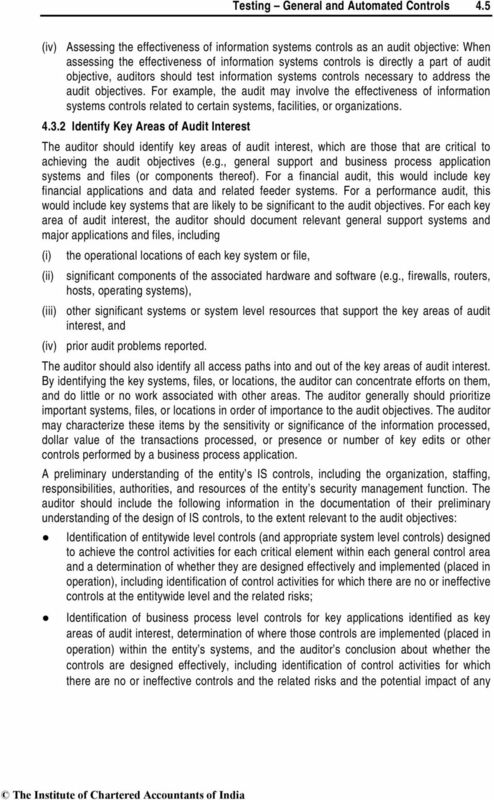 Introduction Chapter is primarily review and integration of the audit framework.